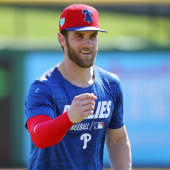 Engel exhibited a noticeable difference while taking swings Tuesday, Scott Merkin of MLB.com reports. Engel was operating out of crouch with his bat laying flat on his shoulders, building on changes he made in the second half of 2018, when he batted .260 after the All-Star break. "I'm just trying to tap into my lower half a little bit more," Engel said. "I feel like I made some improvements last year with the way my upper body was moving, and I felt like my path and my direction they weren't far off." Despite improved batting and on-base percentage over the second half, Engel's .668 OPS (189 plate appearances) indicates more work is needed. There's little doubt about the 27-year-old's defensive abilities -- he was a Gold Glove Award finalist among center fielders along with Mike Trout and Jackie Bradley in 2018 -- but the questions about his stick are loud. As the projected starter in center field, Engel should get a significant number of plate appearances for the rebuilding White Sox in 2019. If an improved on-base percentage comes with that, Engel could build on the career-high 16 steals he had last season.